Time for making savory soups, roasting root veggies, cuddling up with a good book, and snuggling with your cat…. Problem is, Andrei and I have been heartbroken for several years now since Lola’s death. I personally cannot replace a loved one with an instant ‘other’. So, our house has been empty for several years. Book stores and homes are not quite the same without a feline familiar keeping watch. Stirring the energies. The kitties were 5 weeks there. Upon viewing the picture I suggested a proper introduction. These two seemed to have that certain something …. Uh oh… There goes my heart! So we met them, and suspicions confirmed, we wanted to move forward with adoption. Only problem is/was, before you can adopt they need to be spayed (in this instance, as they’re sisters) and we both felt they’re way to little to be operated on. Blah blah blah, long story short (only 3.5 weeks long!) and Andrei and I have become foster moms! 🙂 once the kittehs are big enough (80 grams?) 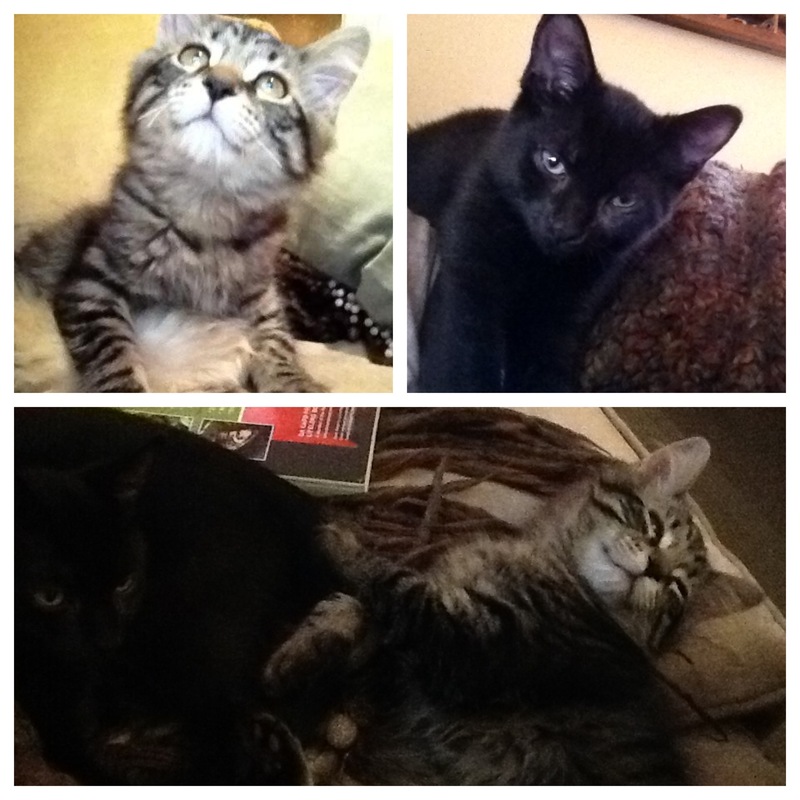 they can be spayed and then we can officially adopt them!! Yay! So, they moved into nanoHQ Sunday, October 23rd. Oh, I should mention that Andrei really felt strongly that they’re names should some how go together. Kind of an inside joke, kind of not. We can hardly pronounce these names so thought, better not. Maybe a bit too obvious. 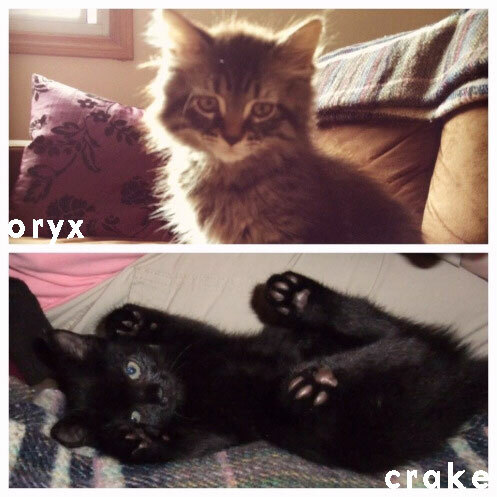 Friends, Romans, and Countrymen (insert drum roll here) meet Oryx & Crake! What is difficult to capture is Crake’s markings. She’s really a black tiger cat. Meanwhile, they’re running amok. Taken over the house. In two nights they’ve seemingly decided my hair makes the perfect sleeping nest. And while they are super punks! Crazy cat circus! They are also beyond super sweeties. Love to cuddle. And are currently crashed out on the sofa now. Shhh. Next Post Blog Carnival Monday: Why do you make jewelry? Thanks, A. Crake reminds me of Jagger too! Crake (Oryx is the light tiger) is so sleek and smooth. Very smart. Scarily so, actually. She has started to pick individual kibbles up with her paw, and bring them to her mouth! Plus, she figures out how to get into everything she’s not suppose to- then shares this newly attained knowledge with Oryx.